What is the Recreational Pilot Permit? The Recreational Pilot permit was designed to bridge the gap between the Private Pilot licence and the ultra-light pilot permit. It is a great way to get started flying, it has lower training times than the Private Pilot licence therefor it is more affordable and can be completed in a shorter amount of time. However, with lower training times comes with reduced privileges. With the Recreational Pilot permit you can fly any single engine aircraft that is designed to have a maximum of 4 seats. You may only carry 1 passengers at a time. 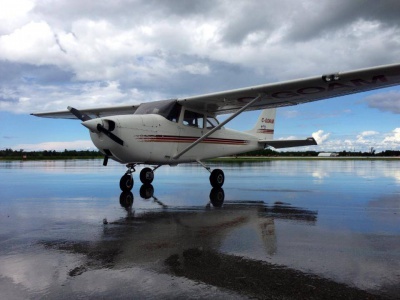 You can fly in Canada during daylight hours only and must fly in good weather conditions – what is termed VFR weather. Why choose the Recreational Pilot Permit? The reasons to choose the Recreational pilot permit over the Private pilot licence vary to each individual. You may be under 17 years of age and wish to start flying. To hold a Private pilot licence you must be 17 years old. The restriction of 1 passenger many not be an issue for your flying. The type of flying that you envision yourself doing may be the right fit for the training that the Recreational Pilot permit offers. You may never want to fly to other airports or longer distances, fly at night or larger more complex aircraft. If you decide at any point during your training that you would prefer a Private Pilot license, you can easily do so and all of the training you have completed so far will be credited towards the PPL. All above are very valid reasons to choose a Recreational Pilot permit. Please let us help you decide which program best suits your needs and wishes. In order to fly the aircraft by yourself, also referred to as “Solo”, you must be at least 14 years old. To hold the permit (licenced) you must be at least 16 years old. 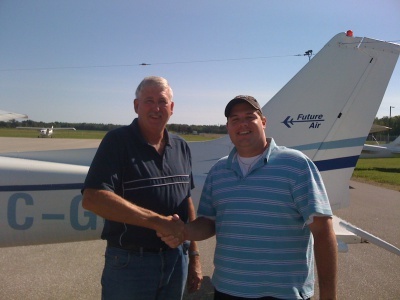 What is involved in getting my Recreational Pilot Permit? In order to hold any permit or licence in flying there is a written examination and a practical test in the aircraft that you must successfully complete. The Transport Canada minimum for a Recreational Pilot permit is 25 hours of in flight training. 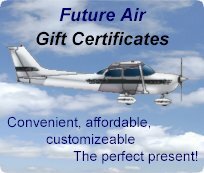 Future Airs' typical student will be licenced for a Recreational pilot permit in the 30 to 35 hour mark. This is based on what it takes the average pilot flying on a regular basis to complete. Our experience has shown us that this is a realistic estimate for completion of the Recreational Pilot permit. There is no requirement to undertake Groundschool, however you must complete a written examination. This examination is an 80 question multiple choice exam; the main areas that are test are Air Law, Meteorology, Navigation and General knowledge. The ground school covers all required areas including Air law and airspace, Engines and airframes, Meteorology and navigation, Flight Operations, Flight Instruments and Human Factors. There are several tests that are involved; prior to your first solo flight you must pass a “presolo” knowledge test called the “PSTAR”. You must also hold a restricted radio operators certificate and a medical examination. Prior to being able to hold the Recreational Pilot permit you must pass a written examination and a practical test in the aircraft. All of these examinations are done with us, we have Transport Canada approved examiners in house available for you. What is the estimated cost of the Recreational Pilot permit? Remember that every student learns at a different pace, so the cost provided will always be a ball park figure. With Future Air’s many years of experience with are confident with the price breakdown. Nominal fuel surcharges may also apply. Taxes are extra.